1) The dodo is the ultimate icon of extinction. It was likely the first species that humans realised they themselves had completely exterminated. This is probably why, whether consciously or not, our visitors are so keen to see it. We have written about the dodo’s natural history and demise on this blog before, so I won’t repeat it again, but rather tell the tale of this collection of 35 bones. 2) Prior to 1865 dodos in museums were extraordinarily rare. At that time there were just remnants from a damaged skin at Oxford, a foot in London (since lost), a skull in Copenhagen and a skull and leg bones in Prague. 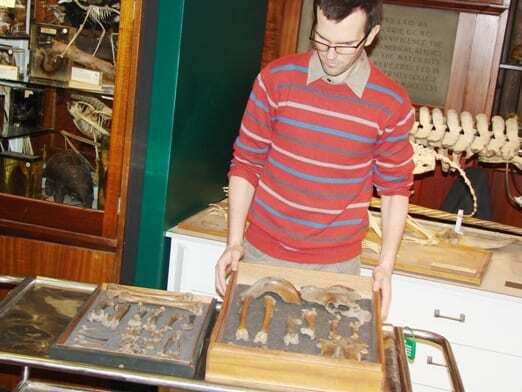 All these specimens, as you would expect, were obtained directly from living animals (that is to say, they were removed from the animals very near the time of their deaths). 3) By contrast, nearly all the dodo material in museums today – including the collection we have – was collected from animals that had been long dead. More than 99% of all dodo material came from a single swamp – the Mare aux Songes (which explains why they are all a muddy brown) . 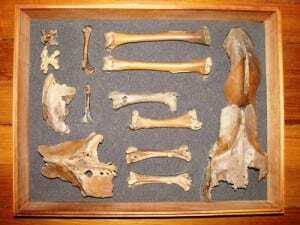 In 1865 a teacher named George Clark, who had long been looking for evidence of dodos on Mauritius, successfuly led a search of the swamp which turned out a few bones. Then by directing local labourers to wade in the marsh, feeling for the bones in the mud with their bare feet, he discovered the majority of bones currently known. These specimens were then sold or donated to museums. It is remarkable to think that nearly all of the existing specimens of such an iconic animal come from one tiny place, and were collected by one man. Uncovering the “new” dodo, on the right. 4) Our own dodo has been one of the media stars of the Grant Museum, after the number of specimens on display here doubled in 2011. 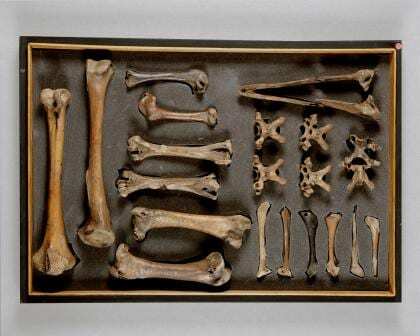 A few years back we found photos of our dodo collection in a (fairly recent) museum report, but only one of the two boxes photographed was known to staff – the other had apparently been lost. Enquiries to all living previous staff yielded no joy. Some time later, when we were preparing to move the Museum from the Darwin Building to our current home, the second box happily resurfaced, at the back of the cupboard which housed our crocodiles. The discovery sparked headlines in the Guardian, and now both boxes are on display. 5) The two wooden trays contain a range of anatomical elements and one might question why we haven’t mounted them into a partial skeleton. I used to think the answer to that was straightfoward – there are two pelves, two sterna and two sets of some of the leg bones, so it would look rather odd. The assumption behind that is that we should have all of the collection on display – more is better. However, I’m now exploring the idea of taking the duplicate elements off display, and having the rest mounted into a partial skeleton. What do you think? *Two specimens have the priveledge of being honoured twice – once accidentally, once deliberately. 100 points if you can spot them. Quammen, D. 1996. The song of the dodo. Scribner’s Pub., New York. Hello, I am messaging here as I cant find an appropriate email to send my message to. I am currently in my final year at the University of Hertfordshire studying Illustration. I am creating an illustrated book on the life of the Dodo, and I have decided I would like to start my story from your display on the Dodo at your museum and work my way back in time to the first time the dodo’s native island, Mauritius, is inhabited by humans. I was wondering if you could give me any extra information about your display, such as where your dodo artifacts came from, who looks after the display etc. I look forward to hopefully hearing from you or if you could point me in the right direction to whom would be best to talk to about this that would be fantastic.